SNS dipping powders create a far lighter, more natural covering for the nails. Customers are astonished to find that within weeks of beginning to use SNS, their nails are becoming stronger and healthier — a complete reversal of their normal experience after a visit to the nail salon. There’s a problem for women who love beautiful nails — a problem SNS has recognized and solved. Conventional varnishes cause lasting damage to the nails, making them weak and brittle. Most customers accept this as the cost of looking good, but SNS refused to accept the trade-off. 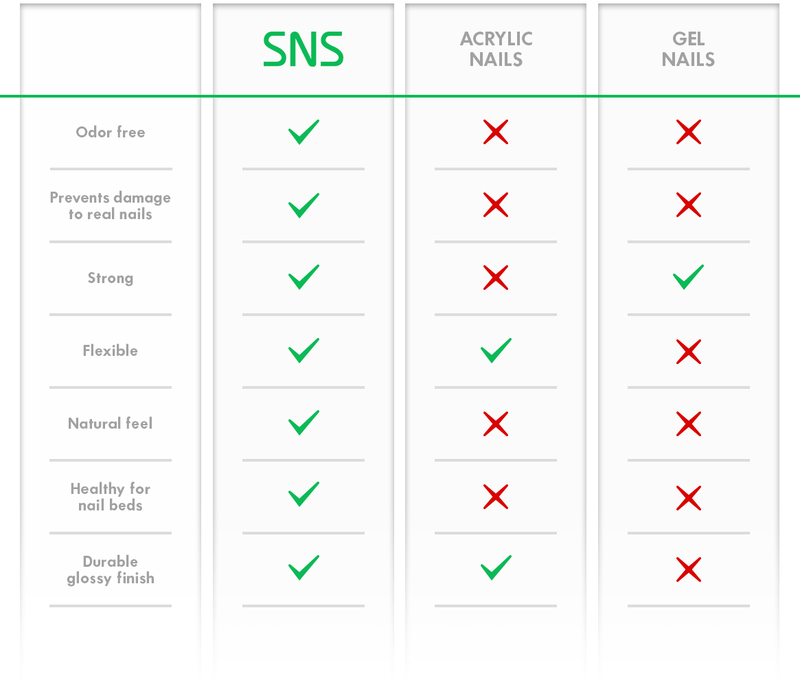 The SNS searched for a solution that would not only deliver exceptional beauty, but also ensure healthy nails. The result was a series of product breakthroughs, beginning in 1990 and continuing through to the launch of the SNS Pre-Bonded Formulas. The centerpiece of these remarkable products made SNS famous: its unique Pink and White Dipping System. What sets the SNS dipping powder apart is that almost all the harmful chemicals have been removed. In addition, SNS has added no less than four vitamins: A, E, D3 and B5, plus calcium, to nourish the growth of healthy nails.